Thanks to the smash hit single "Dahil Sa Yo," Inigo Pascual is living the dream. When Inigo moved to the Philippines to pursue an acting career, he enjoyed a steady stream of movie and TV projects, but he never forgot about music. In November 2016, he released his self-titled debut album under Star Music & Cornerstone Music. His first single, the bouncy "Dahil Sa Yo" became a huge hit to say the least. It topped the local Billboard singles chart for nine straight weeks , in the first quarter of 2017, making this year Inigo's breakout year. He isn't shy about the fact that his biggest dream has finally come true makes him emotional. "Yung Billboard charts kasi big deal yun sa States. Bata palang ako pangarap ko nang makita yung kanta ko doon. Now it's finally happened. I know that others might say ang OA ko naman, pero naiyak ako whenever I think about it. Iba kasi yung significance nun para sa akin. It may just be a chart to some people, but it means a lot to me because it represents a dream come true. I'm grateful and thankful to everyone who helped me make it happen," he says. 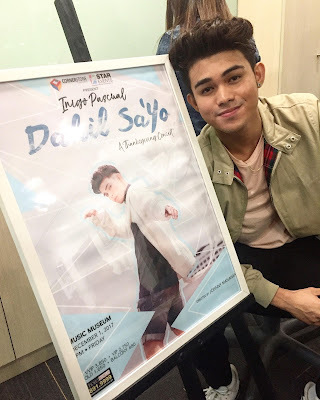 Inigo wrote the bulk of "Dahil Sa Yo," but he insists his co-writer Gab Tagadtad (who wrote the rap verse), as well as his album producers Jonathan Manalo and RB "KidsWolf" Barbaso, deserve as much as credit as he does for its success. This year is Inigo's breakout year for a number of reasons. Aside from his success in the OPM scene, he's slowly going global. After being tapped to play shows like the Dubai One Music X festival and a series of gigs for TFC, Inigo recorded a song titled "Remember Me" for the latest Disney/Pixar film Coco, which opened in the Philippines last November 22.Inigo is only the third Filipino to work with Disney. Inigo will give back to his fans via a musical showcase simply called "Dahil Sa Yo: A thanksgiving Concert" on December 1 at the Music Museum. His friends KZ Tandingan, The Asap Jambayan gang, and his onscreen partner Maris Racal, G-Force are just some of the guests he has lined up. Produced by Cornerstone Concerts and Star Events. Directed by Mr. Johnny Manahan. In cooperation with Academy Of Rock with major sponsor Bench and minor sponsor Sisters Sanitary Napkin. Special thanks to media partners ASAP, MYX, MOR 101.9, Magic 89.9, abscbn.com, OnemusicPH and BillboardPH. For tickets call 891-9999 or log on to www.ticketworld.com.ph. It took Inigo a while find his footing in the industry. In the early days of his career, many doubted whether he'd be able to find success on his own, whether as an actor or a singer-songwriter. But now that he's established himself as a force to be reckoned with, it's safe to say that he's arrived and everyone's waiting with bated breath to find out what he's going to do next.